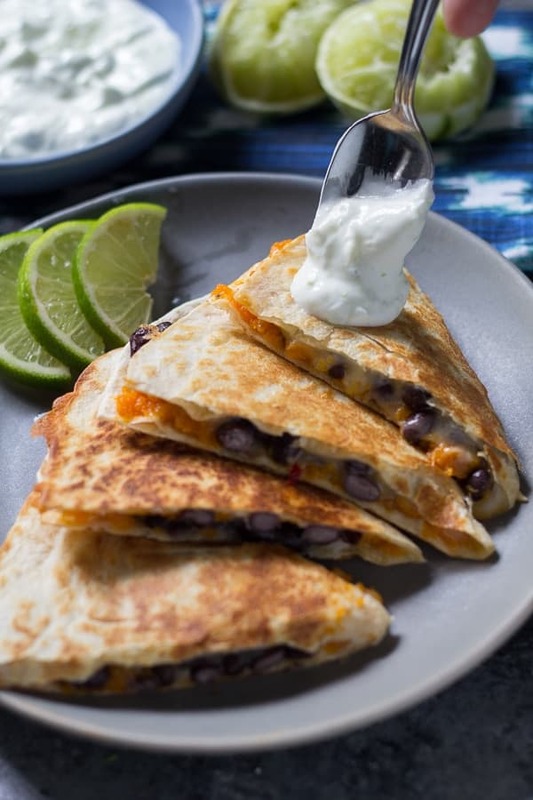 These chipotle sweet potato quesadillas are an easy week-night dinner recipe that combines slow cooked sweet potatoes with chipotle peppers, black beans and cheese. Served with lime yogurt sauce. Note: This recipe is part of my 3-in-1 recipe series in which I provide one base slow cooker recipe, and three ways to serve it. See this post for instructions on crock pot sweet potatoes. I’m just loving this 3-in-1 recipe series! I am sick of making a big batch slow cooker recipe and ending up with a ton of left-overs that I don’t know how to use up. Does that ever happen to you? Well. Whether you’re with me or not, I have a delicious chipotle sweet potato quesadillas recipe for you. 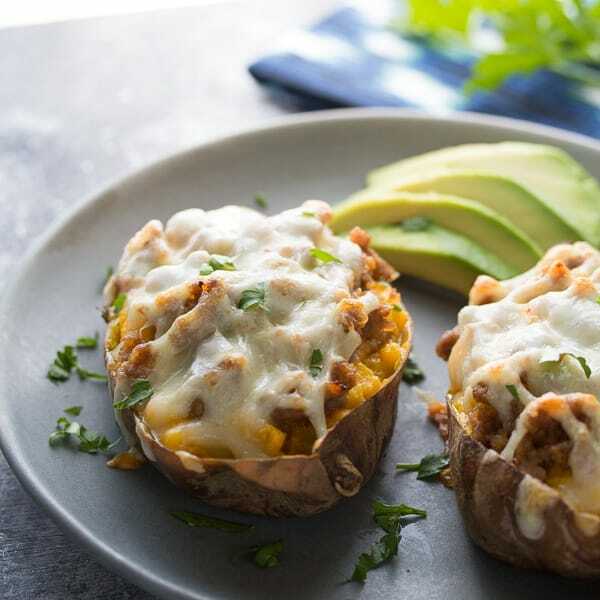 Using the crock pot sweet potatoes we whipped up in this post makes these babies SO easy to whip up. As in under-30-minutes easy. 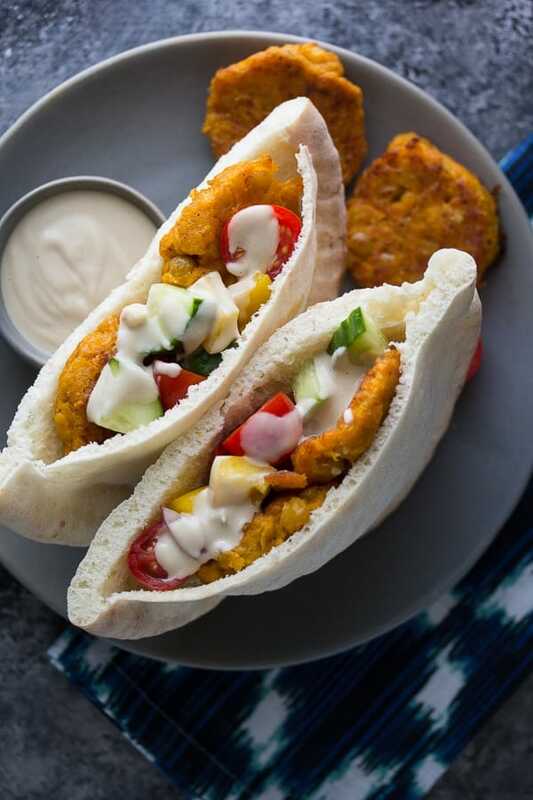 Serve it with lime yogurt sauce, and you have a healthy, delicious, eeeeasy dinner. I love easy. Especially on those challenging week-nights. A note: if you like it spicy, put 1/2 or a whole chipotle pepper in. If you just want a little smokiness and a tiny bit of spice, add the adobo sauce only. Just promise me you’ll make the yogurt sauce, OK? The lime + chipotle + sweet potatoes is just heavenly. 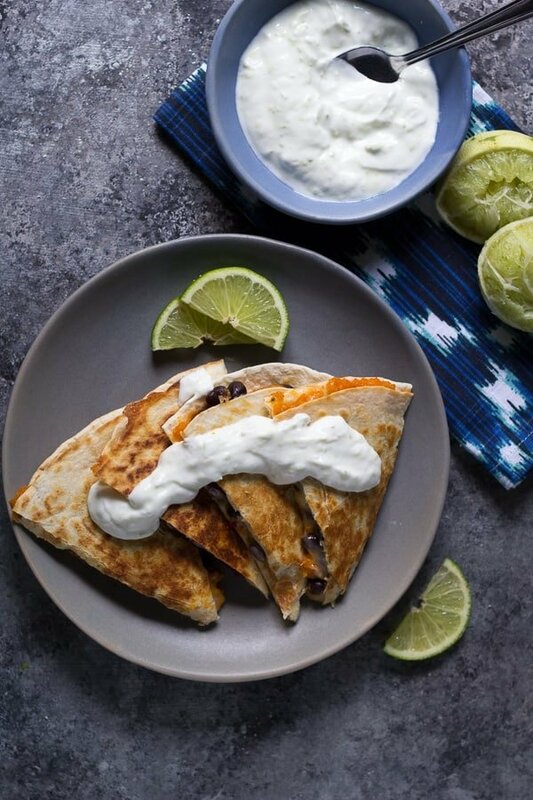 Chipotle sweet potato quesadillas? Aaaand go! 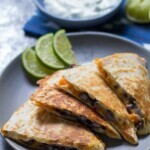 These Slow Cooker Chipotle Sweet Potato Black Bean Quesadillas are an easy week-night dinner recipe. 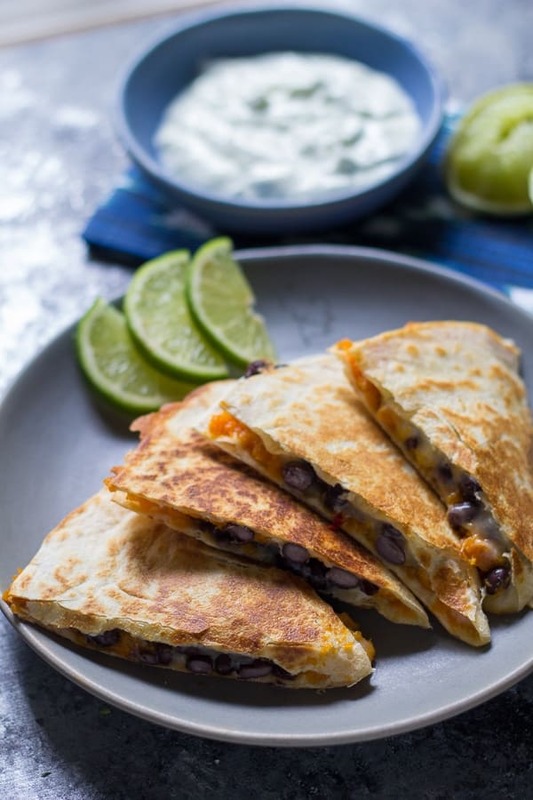 Pre-slow cooked sweet potatoes are mixed with chipotle peppers, black beans and cheese in quesadillas. Serve with lime yogurt sauce. Mix up all Lime Yogurt ingredients in a bowl and set aside. In a medium bowl, mash together the sweet potato puree, adobo sauce, chipotle pepper (if using), salt and lime juice, until completely smooth and mixed together. Place a tortilla in the pan, then spread ⅓ cup of the sweet potato puree over half of the tortilla. Scatter ½ a cup of black beans over the sweet potato puree, then top with cheese. Fold the other side of the tortilla over the fillings, and press gently. Cook for 1-2 minutes, until bottom is lightly golden. Gently flip the quesadilla and cook for 1-2 additional minutes, until bottom is golden and cheese is melted through. Cut into 4 pieces and serve with the lime yogurt sauce. Thanks Denise. I made the spinach/white bean quesadilla over the weekend. It was great! Made it with Bulgarian feta (which has a stronger bite). Also made the chicken pasta sesame salad yesterday with red lentil pasta–it was fabulous! I’m going to try the sweet potato quesadilla later this week. The food theme for the “super bowl party” will be quesadilla variations. These two will be on the menu! Love your site. Just found it as I was searching for meal prep ideas. I’m so happy you enjoyed the recipes, Jill! I hope you enjoy these quesadillas too 🙂 Thanks so much! Hi Jill! I haven’t tried freezing these but I think they would freeze OK? I would crisp them back up on a sandwich press or a frying pan since the sweet potato might release some liquid. 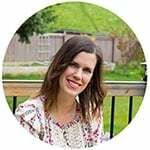 Hi Leanne, I’m in Canada so it might be different, but I always find them with the Mexican food, near the taco shells/salsa etc in our grocery stores. I just made these after such a long day (cooked the potatoes a couple of days ago). They really made my night. I’m in love with the Adobo sauce and I actually used Icelandic yogurt instead for the sauce. Amazing. Can’t wait to try more of your recipies! I had an abundance of butternut squash so made these with that. You can’t beat a recipe that is both simple and tasty. So good. I’m so happy you liked it Martine! I need to try it with butternut squash. I looooove the combo of sweet potatoes and black beans. It is just unstoppable! And your quesadillas crust is so perfectly crisp and brown! Delicious! Thanks so much, Annie 😉 I agree, sweet potatoes & black beans are great together. Quesadillas are just the best! I love making mine extra spicy and with heaps of cheese but I never have tried filling them with black beans before. Thanks for the idea Denise. I’m always looking for a way to jazz up a quesadillas and this looks like a hit, Denise. 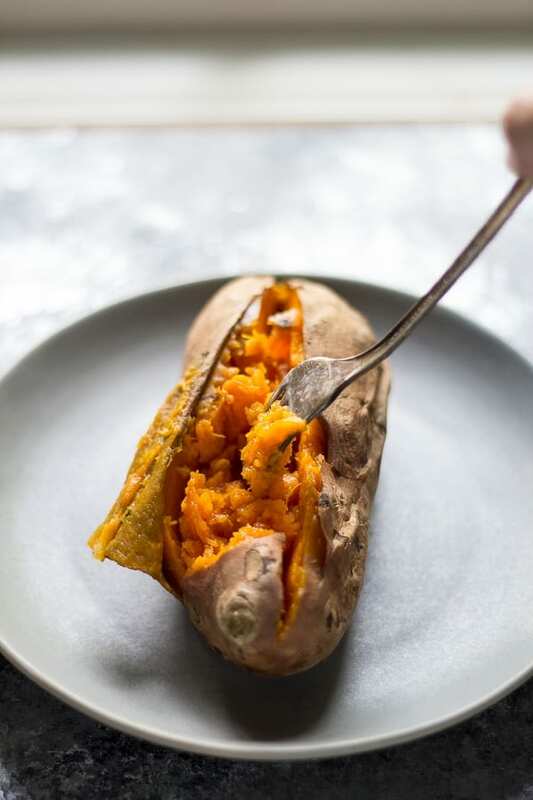 Never thought to add sweet potato before but definitely trying this – it looks delicious! Great pictures, too.